“We are barely surviving,” said a Caracas resident. A monthly wage buys two liters of milk, four tuna cans and a loaf of bread. CARACAS, Venezuela — Antonio Perez, 73, a semiretired real estate agent, woke up at 5 a.m. to stand in line outside a bank to cash his monthly pension. His breakfast was a cup of coffee. By the time he arrived, there were already 140 people there waiting to cash their checks as well. An average monthly pension trades at about $1.81 on the black market. He continues to try to work, but last year was the worst of his career. He couldn’t sell a single property. 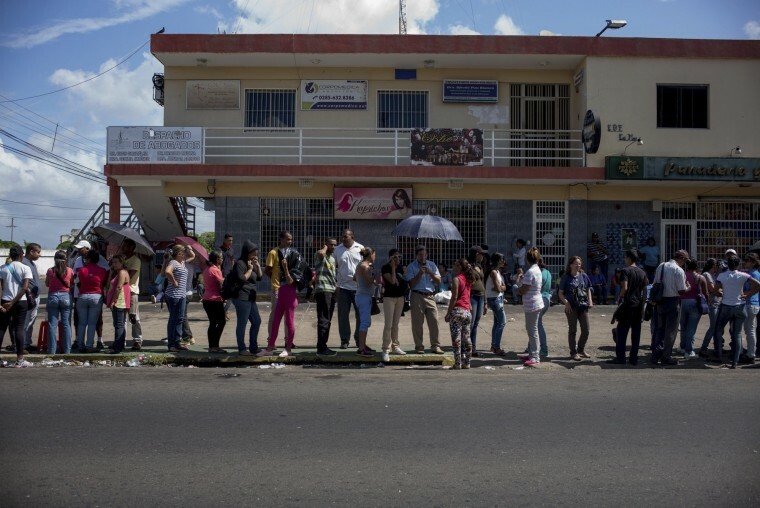 As Venezuela’s economy crumbles, daily life has become a constant struggle, consisting of waiting in line for food and stretching a minuscule wage that each day buys fewer goods. The country's monthly minimum wage of 1,307,000 bolívars — around $6.03 on the black market — is enough for two cartons of eggs, a kilo (about 2.2 pounds) of cornmeal and a box of pasta, or two liters of milk, four cans of tuna and a loaf of bread. With extreme food shortages, hunger and malnutrition are on the rise. But even when food is available in stores, the average salary is not enough to feed a family. Venezuela sits on the world’s largest oil reserve and was once one of Latin America’s wealthiest countries. But as hyperinflation continues to rise to levels not seen anywhere in the world, money loses more and more value. “El dinero no alcanza para nada” — money is not enough to buy anything — or “Todo está demasiado caro” — everything is far too expensive — are common phrases in Venezuela these days. Normal conversations now revolve around what products people can no longer afford. Since President Nicolás Maduro took over the socialist government after Hugo Chávez's death in 2013, the minimum wage has been raised 21 times, the last time on March 1. The steady increase has been seen by economists as a desperate measure to catch up with the steep levels of inflation. The past eight months brought such shocking price surges that Venezuela became the 57th recorded case of hyperinflation in the world — with an annualized rate of 2,000 percent. The Venezuelan government no longer publishes inflation data or forecasts, but the IMF projects that inflation will reach 13,000 percent this year. Belkys Bolivar, 33, wandered around a local market near her home in downtown Caracas. She headed for a shelf where, just three days ago, a carton of eggs was 480,000 bolívars (about $14.40). She picks it up, believing the price is the same, but the clerk tells her that the price has increased, to more than she can afford on her salary as an elementary school teacher. Luckily, her wage combined with her husband’s still allows her to complete her weekly purchases. Prices move fast. Within the same market, the price of meat, chicken, milk and cheese had increased in the last few days. Sosa said many of his clients have eliminated meat from their diet, replacing it with plantain or yucca, a root vegetable. “People are now buying more scrap meat than ever,” he said. Venezuela’s crisis can be traced back to Chávez, who was elected in 1998 on a promise to share the country’s oil wealth with the poor. He relied heavily on oil revenues to fund his “21st Century Socialism,” agenda, importing goods and selling them at subsidized prices to make things more affordable. But when oil prices collapsed around 2014, Venezuela had little savings to fall back on. Since then, the government has cut imports and used its small reserves to pay its foreign debt and avoid default. This has turned into a crisis, with shortages in everything from medicine to food. At the same time, years of excessive regulations have discouraged local production, leaving Venezuela even more dependent on imports. In 2003, the government created currency exchange control and became the sole administrator of American dollars. This created a currency black market where the price of a dollar hovers around 200,000 bolívars. As inflation spirals, some businesses have stopped changing their price tags. The manager of a small coffee shop in Southern Caracas, who declined to be identified, said that the price of coffee changes every three or four days. Standing at the door of his day job as a security guard at a pharmacy, Jonathan Marquez, 40, is tired. He has not slept well in two months, since taking a second job, driving a taxi on weekends. Even with both salaries, he still struggles to feed his family. Marquez’s weekly paycheck of 250,000 bolívars is only enough to buy food. A bar of soap, for example, costs 200,000 bolívars. “Either we clean properly or we eat,” he said. He always picks food and ends up mixing shampoo left over with water and uses the liquid as soap. Inside the same pharmacy, Francisco de Castro, 75, is also facing a dilemma: buy one or two boxes of the medicine he needs to treat his high blood pressure. With medicine growing scarce, De Castro, a retired salesman, hunts daily to find it. If he does, a box of 10 pills can cost more than his monthly pension. He stopped taking a whole pill daily months ago, and instead has been splitting each pill into four chunks. “That way, I feel I take the treatment every day,” he said. Since cash is also scarce, it is not uncommon to find long lines throughout the city of people waiting to withdraw money. On average, ATMs allow the withdrawal of only 10,000 bolívars (5 U.S cents) per day, which can buy two mint candies. Once night falls, there are not many people seeking entertainment outside their homes. A movie ticket costs a third of the minimum wage — without popcorn. A three-course dinner may cost three months' salary. Inflation has also turned the nearly worthless bolívar into art and fashion items. As people walk Avenida Los Ilustres, in southwest Caracas, they may encounter Wilmer Rojas, a 26-year-old artist who tailors purses, wallets and baskets by folding lower denomination bills. Rojas uses up to 1,000 bills to make a large purse. All those bills together don’t buy much — a loaf of bread or a cup of coffee, at most. People even throw them away, since nobody uses the small bills anymore. “At least I found something useful to do with the worthless bills,” he joked.